There’s nothing better than an icy cold soda on a hot summer’s day. But if you’re like me you never have enough room in the fridge because there’s so much food in there for the kids! Once you find the best beverage cooler for you home you’ll wonder why you didn’t get one sooner. These things really are the answer to what we’ve all been looking for every summer. ✅ See the Top-Rated Beverage Fridges, Click Here. This EdgeStar 19-inch wide beverage cooler is a freestanding unit. It includes a blue LED interior light and a lockable door. Capacity is 103 12oz. cans and 5 750mL bottles. Temp goes down to 32ºF for extra cooling. If you’re a soda drinker you know what it’s like to run out of space in the fridge during summer. And if you’re a beer drinker you know you’re sick of being told to stop filling up the fridge with your beer. Whenever I used to entertain friends I always got into a pickle trying to get the drinks cold before everyone arrived. I’d have to go and buy bags of ice and use a large plastic container to hold all the beverages. But of course the ice melts too quickly and your drinks are sitting in an icy mess so they drip all over the floor when your guests take one. Getting a beverage cooler was the best idea. I really wish we’d done it sooner. My advice to anyone else thinking about buying a beverage cooler is to make sure you find the correct one for your needs. There are lots of different models out there with different features. 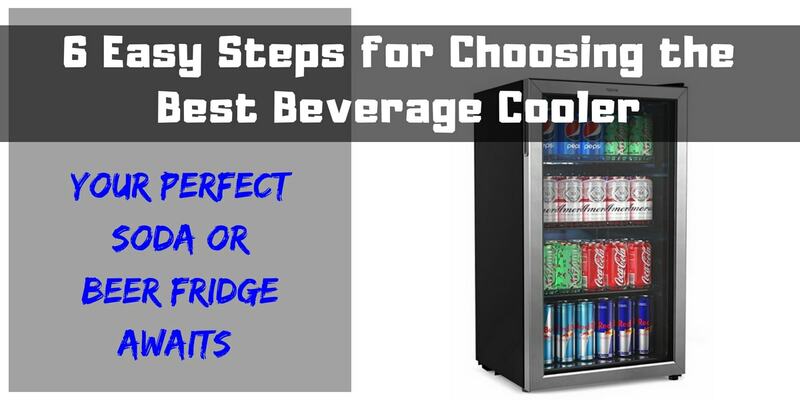 This is why I came up with 6 Steps to Choose the Best Beverage Cooler. Make your decision based on these 6 steps and you can’t go wrong. Step 1 – Freestanding vs Built-In Beverage Fridge? When I first looked at beverage fridges I had no idea what I needed. I didn’t even know what features were available. All I knew was that they came in different sizes but this isn’t the way to find the best beverage cooler. It’s the features that are important as well as size. The first and most important question is whether the best beverage cooler for you will be freestanding or built-in. The reason this is important is because if you’re planning to place your beverage fridge under a counter it all depends on how much room you leave around it for air circulation. This will affect it’s operation and longevity if you get the wrong one. What’s the difference between freestanding and built-in beverage refrigerators? Which is the best beverage cooler? If you need to build in the fridge so that there is no gap left between the counter and the cabinets to the sides of the fridge then you’ll need the built-in type. With the built-in beverage refrigerator there is an air vent at the front bottom edge of the fridge that lets the air circulate and the motor function optimally. A built-in beverage fridge is usually defined by whether it has front ventilation. Most built-in beverage coolers cost more than their freestanding equivalent. There may be some exceptions to this rule but generally, expect to pay more for a built-in model. There’s no clear answer on which type of cooler is best. It all depends on your location for placing it. But, if you know you’ll definitely be building it in then you really should choose a built-in cooler from the start. It will last longer. Can I use a freestanding beverage cooler under a counter? If you’re looking for the best beverage cooler you need to know their limitations. You can still use a freestanding beverage fridge under a counter but you need to leave a sufficient amount of room around it as recommended by the manufacturer. A freestanding beverage cooler will have its vent located at the side or rear of the fridge. It needs sufficient space for ventilation at the sides and rear of the unit to allow heat to dissipate. This means you need space at the top (below the counter) and at each side of the beverage fridge as well as at the rear of the fridge. Without this gap your freestanding beverage cooler will overheat quite quickly and you’ll have wasted your money. Most manufacturers require you to leave about 5 inches of space between the back of the beverage fridge and the wall behind. They also require you to leave about 2-5 inches at the sides of the refrigerator. Freestanding beverage coolers usually only need about 2 inches of space at the back of them to allow for the electrical plug if they’re not being placed under a counter or placed in an enclosed space. Freestanding vs built-in: Is there a difference in dimensions? With built-in beverage fridges they are usually designed to fit under a counter and the depth of the fridge is the correct distance so that it fits under standard sized counters without coming forward too far in front. Of course the width often varies depending on the brand and capacity of the beverage cooler. A lot of built-in beverage coolers will also come in a height which fits under a standard counter. Although you’ll also find ones that are taller too. Freestanding beverage coolers come in a variety of different sizes for placement in different rooms. They usually don’t conform to the length of standard counter depth. Step 2: Under Counter or Taller Beverage Cooler? 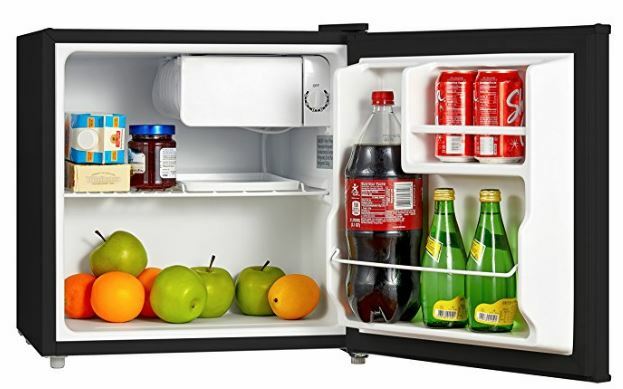 This taller fridge from EdgeStar (CLICK HERE for details) is commercial rated, 52-inch tall, has a security lock, includes adjustable shelves, has LED lighting and temp range 36-43 degrees F.
Most people are looking for a beverage fridge that’s smaller than their normal kitchen fridge. And it’s for this reason that there are loads more smaller beverage refrigerators available in the smaller sizes. However, you can get a taller beverage fridge if you want one. The best beverage cooler for you may be one where you don’t need to lean down too much to get your drinks. Finding the perfect taller beverage cooler is more difficult because there aren’t as many available but there is a way to expand your options. Some of the wine refrigerators can be used as soda or beer fridges. For an even taller beverage cooler CLICK HERE for details on this model. It’s 69-inch tall, commercial rated, has adjustable shelves, comes with a lock, has LED lighting, it’s 14 cu.ft. capacity and temp range is 36-43 degrees. When you’re making your decision you’ll need to check that the temperatures can go as low as you’d like for soda and beer. You’ll also need to determine if the shelves are adjustable to fit your cans or bottles optimally. If you want greater capacity but you don’t have the right place for a taller beverage cooler you can always opt to get two shorter beverage fridges that are matching and place them side by side. Two smaller beverage fridges can then sit side-by-side under a counter or freestanding. You then get the convenience of being able to store more drinks and you still get the lower height you need. There are several ways to judge size of the best beverage cooler for your home or workplace. Here I’m going to use number of cans as the measure. I’d say large is 120 cans or more, small is 60 cans or more and mini is for personal use only. You need to decide on how many cans or bottles you need your beverage fridge to hold. Take into account when you have friends over and whether you’ll be relying on this fridge for large family events like Thanksgiving. Starting with mini, you will want one of these (see picture above, CLICK HERE for details) for your office or in a dorm room. It is very compact but can also keep your lunch cold if you want to use if for more than drinks. It can hold about 24 cans of soda. This is the type of mini fridge that is big enough to be useful for items other than drinks if you want to keep your options open. 2A power bank USB connector. But you should note that this mini fridge is not designed to be used via a computer USB because the power is too low and it will only operate on ECO mode if run through a computer USB. This mini beverage cooler comes in a range of cool colors and designs (CLICK HERE to see the color options). It is the perfect size if you want a portable beverage cooler. The thermoelectric design of this mini cooler means it can be used as a warmer as well! You can go from cooling to warming with the flick of a switch. This mini unit is the best beverage cooler if you’re looking for one to give as a gift because it comes in different colors. It could be a gift for teenagers, moms who want formula kept at the right temperature in the nursery, office workers, college students, camping enthusiasts, RV owners. Just about anyone would love one of these! If you’re looking for a beer fridge that holds 60 or more cans then I put this in the “small beverage fridge” category. 60 cans is a lot but you can still keep the fridge small for convenience in your kitchen, bar, man cave, game room, nursery, office, dorm room or bedroom. This is the best beverage cooler is you’re looking for one that can hold 62 standard 12 oz. cans. It can also hold bottles of vitamin water or sports drinks as seen in the picture above. This 84-can drinks cooler is a very popular small fridge. It is freestanding and 25.2-inch high. It cools to 34 degrees F. This small cooler includes removable chrome racks. This is the best beverage cooler if you’re looking for one that’s affordable. And it’s suitable for any room in the house. You can keep plenty of drinks in this cooler. This small drinks cooler can hold 90 cans. It’s compact and affordable and looks good with its stainless steel trimmed door and white cabinet. ✅ This popular Whynter fridge is sometimes on sale, CLICK HERE to see today’s price. It chills to 30 degrees F and comes with a door lock for security. You get LED lights included with on/off switch. The handle is recessed so there’s no bulky handle to get in the way. This is a good size soda or beer fridge with 90 can capacity. Need a built-in small beverage fridge? This is an 86-can capacity beverage cooler for building in to your kitchen. If you need a built-in beverage cooler take a look at this Avallon model which is 15 inches wide. It has the front ventilation to keep it cool. This drinks fridge cools down to 34 degrees F. It includes LED lighting and you can choose either white or blue lights when it’s operating. It also has a door lock. This hOmeLabs beverage fridge holds 120 cans. The stainless steel door trim looks attractive and it comes with a blue LED internal light. It is 18 inches wide. This is a freestanding drinks fridge offering 3.2 cu.ft. capacity. It can be used as a built-in so long as you leave sufficient room around the rear, sides and top for air circulation as required by the manufacturer. This beverage refrigerator cools down to 36 degrees F.
✅ This is a popular drinks cooler with very happy customers. At the time of writing, this beverage fridge has 5.0 out of 5 stars for 22 reviews on Amazon. Check today’s price here. This Kalamera unit may be the best beverage cooler for anyone looking for a larger capacity drinks fridge. It is 24 inches wide making it larger than many. It is a built-in beverage cooler but can also be used as freestanding. So far, it only has a few customer reviews on Amazon but those who did review it gave it 5.0 out of 5 stars which is good. This Kalamera beverage refrigerator is more expensive than a lot of others but that’s because it has a bigger capacity, it’s a built-in unit and it includes features like 6 removable racks, lockable door and a whisper quiet compressor. Step 4: Glass Front Door or Opaque? Personally, I really like the appearance of a beverage cooler with a glass door. Most of the models include LED lighting so you get an attractive look to your drinks fridge. However, for some people this is not ideal. The best beverage cooler for you may be one without a glass door. You may want an opaque door to hide your drinks from view. Both types of door are available. This EdgeStar stainless steel opaque door beverage cooler (see image on the left) holds 142 standard 12oz. cans. It is a built-in unit with the ventilation at the front. It can also be used as a freestanding fridge. The width is 24 inches. The door is lockable to secure your drinks. It includes glass shelves. There is an interior LED light which comes on automatically when you open the door. It also has digital temperature controls. This is a stylish drinks fridge which can be used under a counter in the kitchen or on its own in a man cave, game room, living room or elsewhere. This Danby fridge looks good in red. With an opaque door, it might be what you’re looking for. If you already have red appliances in your kitchen or bar then this beverage refrigerator is perfect. You can match it with retro or modern styled rooms. The interior of this drinks fridge is notably black with white LED lighting when you open it. It is lockable and has an ergonomic door handle at the top. It includes glass shelves. The door hinge is reversible. Overall capacity is 3.3 cu.ft. This fridge can be used for items other than drinks making it versatile if you want to change its purpose. Many of the smallest beverage fridges don’t have a lockable door. Once you go up in capacity you get more models with lockable doors. If you’re using this as a beer fridge you may want to lock it away from the teenagers in your home! Also, you may want to lock soda away from younger kids so you have control over how often they drink it. Whatever your reason, it’s handy to have a lockable beverage cooler. If it’s not essential to you then you won’t bother including it in your research. However, for a lot of people this is an important feature to be aware of. To see a selection of lockable beverage refrigerators, Click Here. Many of the drink fridges shown above are also lockable and this is usually stated with the product. If you’re looking for the best beverage cooler for soda you’ll want a different fridge for your wine. Luckily you can get dual temperature beverage refrigerators that are good for both. You’ll need to take into account the shelving space as well as the temperature control if you’re looking for one of these beverage coolers. This NewAir Dual Zone Refrigerator lets you keep beer or soda on one side and your wine bottles on the other. Each zone can be kept at a different temperature. If you’re looking for the best beverage cooler to do two jobs then this is the type to buy. This is a built-in model but it can also be used freestanding. With the front vent you get the choice to build it in, under a counter in your kitchen or bar. This dual zone beverage cooler and wine fridge holds 60 cans and 18 bottles and yet it’s nice and compact at 24 inches wide. Each side of this dual zone fridge is lockable giving you control over your drinks. The digital controls allow you to get accurate temperature within each side. You get blue LED lighting included in this dual zone beverage cooler and wine fridge. The temperature range is 36ºF to 72ºF for each side. This type of dual zone refrigerator with glass doors, blue LED lighting and stainless steel doors looks stylish in your kitchen or bar. Personally I’m a big fan of this type of beverage cooler. I really like being able to see the wine bottles as well as the soda. It makes it easy for kids to choose their soda before they open the fridge door. And you can keep the wine side locked if you want to. This type of beverage refrigerator looks good built-in under a counter. ⇒ Want to make salads faster? Try a mandoline slicer. ⇒ Looking forward to homemade ice cream? See the best Cuisinart Ice Cream Makers here. ⇒ Want to lose weight for summer? Try a juicer, see all the details you need on the Breville Juice Fountain here. This entry was posted in Small Appliances on June 8, 2018 by Edwina.